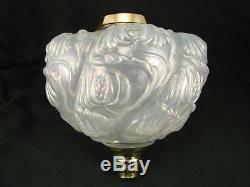 VICTORIAN MOULDED WRYTHEN OPALESCENT GLASS OIL LAMP FONT ART NOUVEAU DECORATION. BEAUTIFUL LARGE VICTORIAN OIL LAMP FONT. This stunning oil lamp font is in a moulded glass with an Art Nouveau decoration to the wrythen decoration of the base, sides and top. The font is in an opalescent glass, which has an irridescence in the light. The polished brass undermount measures 2.3cm in diameter and the screw thread collar measures internally 3.9cm. Of larger proportions, the font stands 16.7cm tall inclusive of the brass mounts and measures approximately 16cm in diameter. Please see condition report and photographs to satisfy yourself to condition and style. A superb and beautiful font which displays well and will make a perfect acompaniant to a Victorian oil lamp base. Thank you for looking and please view our other quality listings including many other oil lamps, parts and accessories. We aim to sell quality authentic antiques and collectibles to the discerning customer. Please be sympathetic to the fact all of our items are used, sometimes for hundreds of years! International buyers please be aware that we only post. This is to ensure your item is delivered safely and in good time. For items weighing 2kg and over or large items we use. Parcel Force Worldwide Global Priority. This is a tracked service. We will provide a proof of posting certificate to support any personal claims you may initiate with the Post Office regarding your item should it be lost or damaged in transit. These charges are the buyers responsibility. We are happy to answer any question or offer advice on our items please feel free to contact through the designated messaging service. The item "VICTORIAN MOULDED WRYTHEN OPALESCENT GLASS OIL LAMP FONT ART NOUVEAU DECORATION" is in sale since Wednesday, July 29, 2015. This item is in the category "Antiques\Antique Furniture\Lamps\Victorian (1837-1901)". The seller is "elimayboo" and is located in Bury St Edmunds.